A stack is an ordered list in which insertion and deletion are done at one end, called a top. The last element inserted is the first one to be deleted. Hence, it is called the Last in First out (LIFO) or First in Last out (FILO) list. 1. In below diagram, the first image shows a container is filled with balls we will try to always take a last inserted ball so it is a last in first out. The second image is a list of mail envelopes and most of the peoples will always take the topmost envelope and then second top etc. 2. A pile of plates in a cafeteria is a good example of a stack. The plates are added to the stack as they are cleaned and they are placed on the top. When a plate, is required it is taken from the top of the stack. The first plate placed on the stack is the last one to be used. The following operations make a stack an Abstract Data Type. Lets first familiar with few concepts that are used in stack implementation. When an element is inserted in a stack, the concept is called a push. 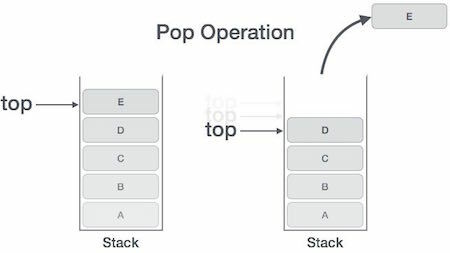 When an element is removed from the stack, the concept is called pop. Trying to pop out an empty stack is called underflow (treat as Exception). Trying to push an element in a full stack is called overflow (treat as Exception). 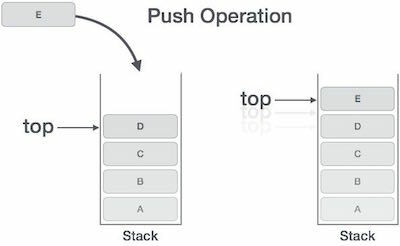 The process of putting a new data element onto the stack is known as a Push Operation. Step 3 − If the stack is not full, increments top to a point next empty space. If the linked list is used to implement the stack, then in step 3, we need to allocate space dynamically. int top(): Returns the last inserted element without removing it. int size(): Returns the number of elements stored in the stack. int isEmptyStack(): Indicates whether any elements are stored in the stack or not. int isFullStack(): Indicates whether the stack is full or not. Following are some of the applications in which stacks play an important role. There are many ways of implementing Stack; below are the commonly used methods.